Up until now, baffling the oil pan has been something that you have sent out to a tuner company such as ours to have done. This requires extra shipping expense, down time and elevated costs. Now you can purchase the inexpensive components and do it yourself or have a local welding shop install the parts. In order to install the kit, the oil pan must be removed from the car. So when you're doing a rebuild or bearing replacement, this is the best time to baffle your oil pan. No welders in your area? 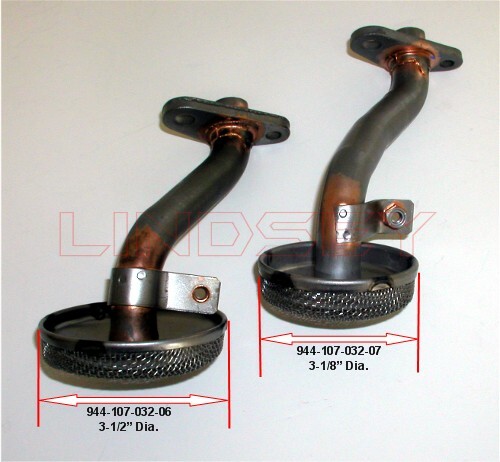 You can send your oil pan and pick up tube to Lindsey Racing and we can perform the installation for you. Typical 24-48 hour in house turn around at a total cost of $164.95 (Parts & Labor). We have found that early 944s have a larger diameter pick up tube screen and later models have a smaller one. Click here to see the two models . To accommodate this, we supply a oversize stainless steel ring for the oil pick up and you trim to fit your specific diameter. In addition, the '87 and later cars have an oil level sensor. We have broken the kits up into two models. The EARLY kit for '86 and earlier models without the level sensor, and the LATE kit for the '87 and later models with the oil level sensor. See our Tech Garage for install pictures.